I’d been looking forward to this match since I qualified way back in April and thankfully when I woke up, my back didn’t feel too bad. I stopped in the Little Chef for brekkie on the way and arrived in good time. 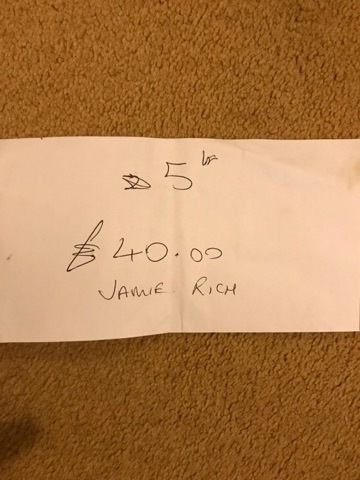 As I went to pay my pools, it was lovely to see the legend that is Charlie Barnes had come along to watch today and it was a beautiful day for it with blue skies and no wind for a change. Jeff said he was paying out the top five and then said he would call people up to draw in the order they qualified. 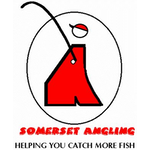 Pete also announced that there was £45 up for grabs for whoever caught the biggest perch. John Barker was first and pulled out peg 4, then Pete drew 33 and Bruce Hunt was next door on 32, Jeff was on 37 and then Ziggy drew 34 before it was my turn and nearly all the fancied 30’s had gone already. I stuck my hand in the bucket and pulled out peg 17 on the bottom bank, I quite fancied it although 19 is the better peg. 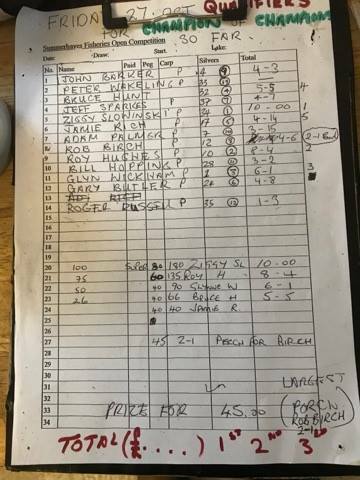 Adam Palmer ended up with peg 7 and I really wouldn’t have wanted that today, Rob Birch drew 12, Roy Hughes pulled out 10 and wasn’t impressed, Bill Hopping was on 28, Glynn Wickham on 1, Gary Butler on 24 and Roger had the last ball in the bucket which was number 35. I drove down and parked up and as I took my kit to the peg, I realised I had loads of space as 19 wasn’t in and my nearest neighbours were Gary on 24 (who I couldn’t see) and Rob on peg 12! Although a lovely day, the pond was flat calm which isn’t ideal and I said to Rob that I reckoned you’d need 12lb to win and 10lb to frame. I set up the usual 0.3 gram NG Mini Gimp for the top two lines left, middle and right and also at top two plus one to the left and straight out, the other rig was a 14 x 11 MW F1 Slim for two ten metre lines. On the side tray I had some dead red maggots, 2mm Bait-Tech Carp and Coarse Pellets plus some 4mm Xpands for the hook and I also mixed up some Special G Dark groundbait. After speaking to Ads Palmer in the week, I’d decided to tweak my usual approach slightly and not actually feed my longer lines until I was about to fish them. 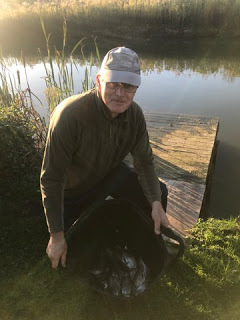 The whistle went at 10:30 and I fed some micros on the left hand and central top two lines and then put in a ball of groundbait on the right hand line. I started on the left with a 4mm soft pellet on the hook and had to wait a little while for my first bite which of course I missed, then the next two indications also saw me strike into thin air, I finally hit the next one but a poxy carp of a pound and a half wasn’t the result I wanted! After thirty minutes, I still hadn’t had a silver and this wasn’t in the script! I switched to the middle top two line and finally got off the mark with a 4oz skimmer and then had two more and missed a bite in the next three chucks and I was starting to enjoy myself. As the first hour came to a close I just had those three fish for 12oz or so and although I wasn’t bagging, I was getting a few indications. 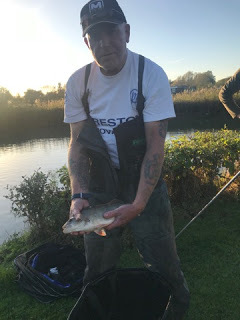 I had another small skimmer at the start of the second hour and then a better one of 8oz or so, I tried the left hand line again but after that initial flurry of bites I never had another indication there. My next fish from the middle line was a good skimmer around a pound and then I had another little skimbob to put me nearly 3lb after an hour and a half. I was just thinking I could do a decent weight when the bites just stopped, I tried the right hand line but never had a touch there, back on the middle line and I had another decent skimmer but that was it. 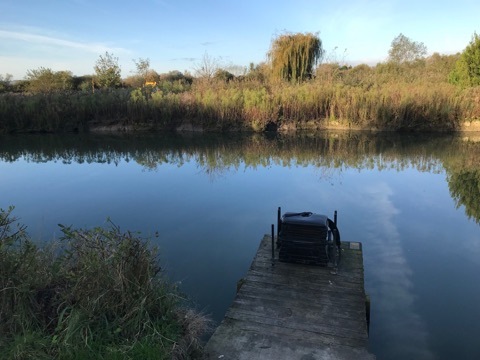 As the halfway point approached, I was really struggling but I wasn’t the only one, Rob shouted up that he’d only had a couple of small skimmers and from what I could see Ads was only catching the odd roach. It was time to start a couple of new lines so I cupped in some micros at top two plus one to the left and straight out. I had a 3oz roach first put in but the next indication saw me lose a foulhooked carp so I tried the middle line and the only action was a small roach that came off as I shipped back. I tried double dead red maggot and had a few small roach but it was slow going. I started getting carped out and it looked like Rob was as well although he hooked one that he seemed to be playing very carefully, he netted it and let out a little whoop before shouting up that it was a big perch, on paste of all things! With two hours to go, I couldn’t get a bite on any of my shorter lines so put in half a pot of micros at ten metres before going out with my other rig, after a few minutes the float sunk from view and the strike was met with a few inches of blue hydro showing itself, I shipped back gently and netted a 4oz skimmer, next put in I had another and I started to think there was still time to stage a comeback. Ads came for a walk and said he was really struggling, he said Roy was admitting to 4-5lb and Rob just had that big perch and a couple of small skimmers, while he was there the float sailed away but this time it was a carp, after I netted it, he carried on round the pond to see how the others were doing. Next put in I had a carp around 6lb and that was enough of that, I started another ten metre line but this time, my first fish was a carp and another followed, I decided to give it one more go and had a small skimbob but when the next fish was a carp, I decided to spend the last hour on my top two lines, especially as Rob had just landed a big skimmer on his short line and there now wasn’t much between us. In amongst several carp, I did manage one more skimmer but as the whistle went to end the match, I was unhooking yet another carp. My final tally was 12 skimmers, a better roach and a few small ones for around 3-4lb, a real struggle and I was sure it wouldn’t be any good today. 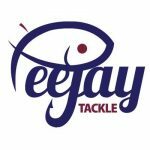 I was still packing up as the scales party reached peg 7 so walked up to get a few photos, Ads weighed 3lb 15oz and looking at the board, John Barker had weighed 4lb 3oz on peg 4 and top weight so far was Glynn with 6lb 1oz from peg 1. 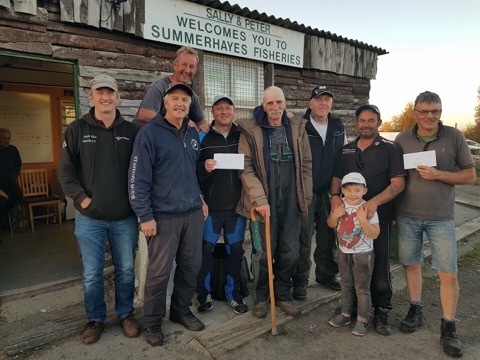 Roy Hughes was next and had done well to put 8lb 4oz of small skimmers and roach on the scales. 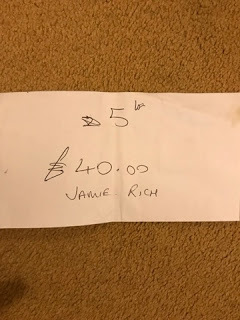 Rob had 4lb 6oz but crucially his perch was 2lb 1oz and he was looking good to take home the £45 perch prize, I was next and my fish went 4lb 14oz but with Ziggy admitting to 9lb and Jeff saying he had 4lb (which would be 6lb given his recent estimates) along with small fish maestros Gary and Bruce still to weigh, I was sure it wouldn’t be enough to frame. 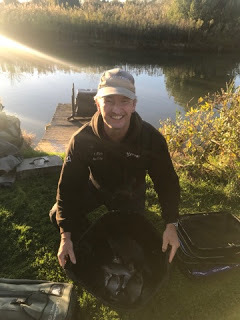 As I took my kit to the car, Gary Butler had just weighed 4lb 8oz and then Bill had 3lb 2oz on peg 28, I didn’t see the rest of the pegs weigh as I was loading the car. As I drove back up the track I saw Ziggy and asked if he’d won it, he said he had with a level 10lb – well done mate. I parked up and as I took my nets back, Jeff said I was in the money! Bruce had weighed 5lb 5oz on peg 32 but then Pete had chucked back on 33, Ziggy was on 34, Roger had 1lb 3oz on 35 and Jeff weighed 4lb 7oz from peg 37 so I’d sneaked last in the money. So a really enjoyable day and the banter was great, huge thanks to Pete and to Jeff who did a great job running the matches, I’ll definitely be trying to qualify for next years final.